Product #16854 | SKU HI5-FIBER | 0.0 (no ratings yet) Thanks for your rating! 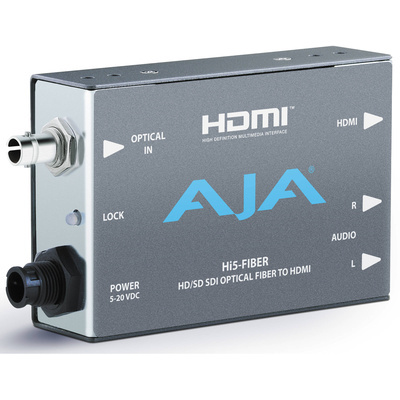 AJA's HI5FIBER HD/SD-SDI Over Fibre to HDMI Video and Audio Mini-Convertor converts HD/SD-SDI over single mode 1310 nm fibre-optic cable (ST-style fibre connector) to HDMI for driving HDMI monitors. Embedded 8-channel HD/SD-SDI audio is supported in the HDMI output allowing a convenient single cable audio/video connection. The Hi5 provides 2-channel RCA style audio outputs for separate audio monitoring if needed. A 3.28' HDMI cable comes included, along with a universal power supply that comes with international plug connectors for use around the world.